This article is about CD video, a hybrid analogue/digital format. For the more successful all-digital format, see Video CD. CD Video (also known as CDV, CD-V, or CD+V) is a format of optical media disc that was introduced in 1987 that combines the technologies of standard compact disc and LaserDisc. CD-V discs are the same size as a standard 12-cm audio CD, and contain up to 20 minutes' worth of CD Audio that can be played on any audio CD player. It also contains up to 5 minutes of LaserDisc video information with digital CD-quality sound, which can be played back on a newer LaserDisc player capable of playing CD-V discs. One of the first LaserDisc players that can play CD-V discs is the Pioneer CLD-1010 from 1987. Though it is a CD-based format, CD Video was never given a rainbow book designation; the idea of encoding analogue video, which is incompatible between different regions, was poorly received by CD stakeholders other than Philips, who had not consulted them prior to demonstrating the format to the music industry. CD Video discs have a distinctive gold color, to differentiate them from regular silver-colored audio CDs. This is a characteristic that would later be replicated in HVD, a more advanced disc format. A similar version of CD Video called Video Single Disc (VSD) was also released. It is basically the same as CD Video, but it only has the analog video track (occupying the whole storage space of the disc), so it is in effect a small LaserDisc. CD Video was targeted toward teenagers who watched music videos on MTV. However, few of them were familiar with LaserDiscs, and far fewer owned CDV-compatible players at the time. Buying a costly new player was not an option just for the minor use of playing a single music video more easily accessible through a VHS videocassette, either purchased pre-recorded or recorded off a television programme with a VCR. 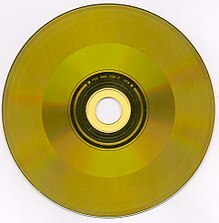 The term "CD Video" and its logo were also used on some full-size (8- and 12-inch) LaserDiscs with digital audio (for movies as well as for music titles), to distinguish them from the previous LaserVision format with analog audio and, presumably, to leverage the consumer recognition of the successful CD-Audio format. Though CD Video lasted only a few years in the marketplace and began disappearing by 1991, its legacy would live on with the all-digital MPEG-based Video CD format, which came out a few years later in 1993. A typical CD Video release in its case. This contains three audio tracks and one video by the band Lloyd Cole and the Commotions. ^ "Digital audio modulation in the PAL and NTSC video disc formats, J. Audio Eng. Soc. vol. 32, pp. 883, 1984". Retrieved 2008-03-04. ^ "Problems ahead for CD Video". New Scientist. 1986-12-11. Retrieved 2018-07-31.